Hydrofilm® is reliable transparent adhesive film dressings that protect wounds from bacteria and water. They have a high moisture vapor transmission rate (MVTR) that helps prevent moisture build-up under the dressing. This helps avoid unwanted "peel-off" of the dressing. It helps secure dressing on the skin comfortably for longer wear times and the adhesive used on the dressing is hypoallergenic. The film conforms to body contours with a low profile. 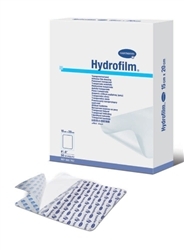 Hydrofilm® provides a secure and reliable fit and the clear film allows wound assessment without dressing removal. It also enables the patient to shower with dressing in place while providing a barrier to bacteria. Precaution: Hydrofilm® should not be used as a primary dressing on clinically infected, bleeding, or heavily secreting wounds. Hydrofilm® is for use as a post-operative and primary dressing to protect against secondary infection and to cover non-exuding wounds. 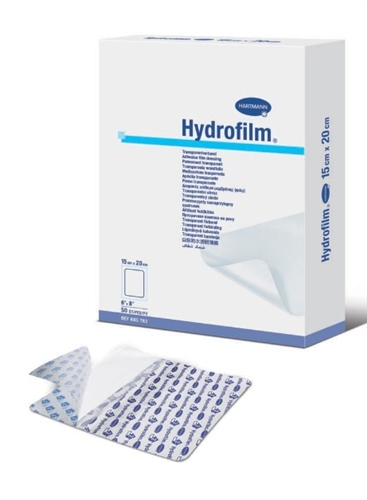 Hydrofilm® is also ideal for use as a secondary dressing for fixation of catheters or cannulas, or as a secondary dressing to cover primary calcium alginates such as Sorbalgon®. Hydrofilm® is available in many sizes including 2.4" by 2.75", 4" by 5", and 6" by 8".